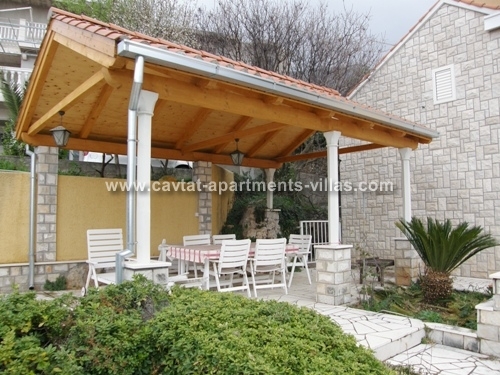 Situated in a quiet village Plat known for its beautiful beaches just 5 km from Cavtat this apartment would suit a family or two families travelling together looking to stay within walking distances of local restaurants and wonderful pabble beaches. The apartment is entered from the narrow road via external stairs into a huge garden on the first floor with BBQ and terrace furniture overlooking the sea. The main house door leads you into a small hallway and further on same floor there is a separate fully equipped kitchen, a diner area, a bathroom, a living area and a spacious terrace with sea view. Internal stairs lead up to the second floor with two double rooms and one triple room, each with a balcony, a separate shower room and a ensuite bathroom (triple room). The first floor is air conditioned. There is a private parking for three cars on the site.